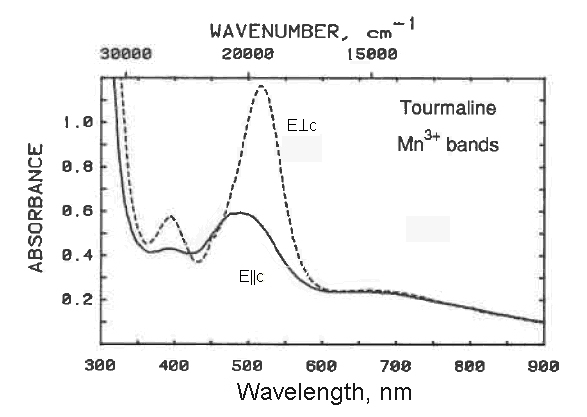 The optical spectra of elbaite tourmalines subjected to large, controlled doses of gamma radiation have been compared to those of natural specimens. Both naturally pink and laboratory-irradiated elbaites show the same spectroscopic features. Optical absorption features of Mn2+ in nearly colorless elbaites are lost during laboratory irradiation, indicationg a Mn2+ - Mn3+ transformation during the radiation process. Measurements of the radiation levels in tourmaline pockets in sourthern California pegmatites have been used to compute the doses that natural samples should have experienced over geologic time. These doses generally correspond to the doses required to restore the color to elbaites that have been decolorized by laboratior heat treatment, indicating that color in naturally pink tourmaline is a product of natural radiation. This radiation could have been effective only after the pegmatite cooled below the decolorizing temperature of tourmaline, suggesting that most pink elbaites orginally grew nearly colorless in the pegmatites and only later attained their pink color through oxidation of Mn via ionizing radiation.